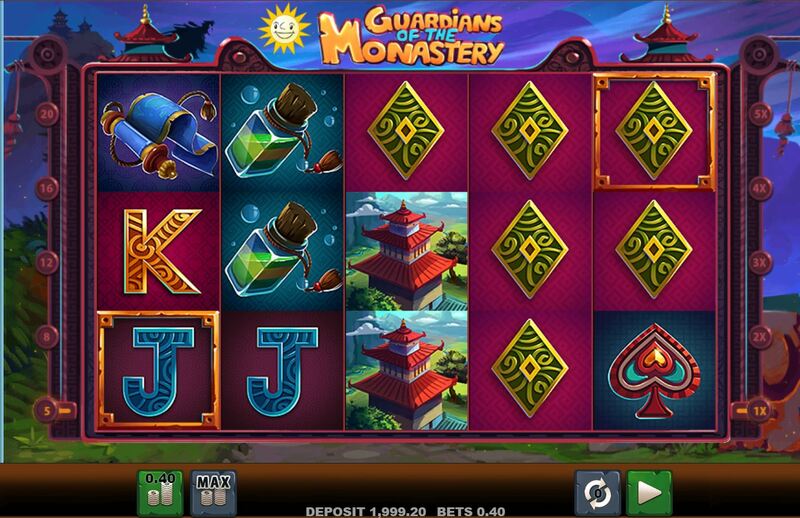 Guardians of The Monastery slot takes us to the mountains of Tibet where Buddhism and the symbology of nature prevail in the local traditions. The game lies over night time silhouettes of the beautiful temples and we have the local music playing as we spin, with just a gentle tap as the reels stop. There are hints of Konami's China Mystery here combined with Journey To The West by Genesis Gaming although we are most definitely over the other side of the Himalayas here! Don't be fooled by the peaceful reputation of these monks though as they carry some fearsome swords as we'll see, but will our bankroll be slashed too? 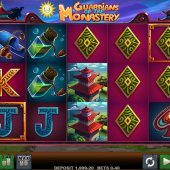 We immediately see there are stacked symbols on Guardians of The Monastery slot but the pays are nevertheless quite good for a 20-line game over 5 reels of 3 rows, but we'd expect that from Merkur whose games are usually quite volatile. There are single Wilds on all reels which are either one of two different Monk characters and pay the best 5-of-a-kind award at 50x bet along with the Pagoda, the Bottle is 25x, Scroll 15x, Temple Bell and Pattern 12.5x with five card values awarding either 5 or 2.5x for a full line of 5. There are no scatters here but worry not, we still get a decent bonus round in a rather unusual way! On the grid you will notice there is an ornate surrounding to both the bottom left and top right tiles on the grid. By the left of reel 1 there is a scale 5-8-12-16-20 and by the right of reel 5 a scale of 1x-2x-3x-4x-5x. These scales begin at minimum values and will increase by one position upwards if a Wild lands in their respective squares. You can get both in one spin too and when either one reaches the top you will trigger free games, the quantity being on the left and the multiplier on the right. You don't get retriggers but on reel 3 there is a mystery Crystal icon which will add 1 free spin to your total remaining if appearing.